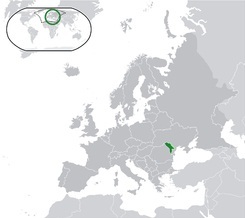 Moldova - officially the Republic of Moldova is a landlocked state in Eastern Europe located between Romania to the west and Ukraine to the north, east, and south. It is an independent state with the same boundaries as the Moldavian Soviet Socialist Republic in 1991 as part of the dissolution of the Soviet Union ( Russia ) with its capital Chisinau or Kishinev in Russian. However still you can see all the marks of the Soviet Union in Moldova from Lada cars, Soviet style buildings and Soviet behavior from the Moldavian people. A strip of Moldova's internationally recognized territory on the east bank of the river Dniester has been under control of the breakaway government of Transnistria since 1990 and the capital is Tiraspol. Moldova is mostly an agriculture country and one of the poorest countries in Europe and Eastern Europe. However for tourist there is a lot to do, from wine tasting, to night life and traditional Moldavian dinners. Moldova host also nice resorts and hotels from relaxation and prices are much cheaper than in Western Europe. Moldova visitors may choose from a great deal of hotels, which vary from budget family hotels to ultra luxury hotels or properties featuring original antique furnishing. Travelers to Moldova with limited budget may stay in hostels, private apartments, guest houses or choose one of the budget state Soviet hotels in Moldova. Check hotel prices and compare hotels on Browse-Hotel.com. Browse Hotels in Moldova. Browse Hotels in Chisinau. Chisinau, in Russian Kishinev is the Moldavian capital situated in the center of Moldova. With its Soviet buildings and Black Sea architecture and bright nightlife. Odessa, the 2nd cit of Ukraine situated at the Black Sea in the south of Ukraine, close to Moldova, just 2 hours drive from Chisinau to the Black Sea. Take advantage of FREE ROAMING during your travel in Moldova. Get a roaming free SIM CARD and safe money on mobile phone calls in Moldova. Find cheap hotel deals in Moldova and get your Moldova hotel with low hotel price guarantee in any destination in Moldova right here.